A group of protestors outside the Hilton Hotel Wednesday morning were arrested for blocking rush hour during a rally organized to criticize the President’s lax approach to immigration reform. A group of undocumented Chicagoans were arrested Wednesday morning outside the Hilton Hotel for blocking the morning rush hour to denounce the President’s, who is in town for a fundraiser event, ‘inhumane’ approach to immigration laws. Protestors, representing Undocumented Illinois, Immigrant Youth Justice League, Latino Youth Action League of DuPage, and the Illinois Coalition for Immigrant and Refugee Rights, urged the President to stop deportations and pass a law that will keep families together. In 2012 the Department of Homeland Security (DHS) announced record-breaking deportations of over 409,000 people in the last year. In the past months, there was confirmation that DHS has focused on enforcement to meet an annual 400,000 person quota, and that a majority of the one million people deported in the last four years had no criminal record. “It doesn’t make sense to keep deporting people that could qualify for immigration reform. We want our families to still be here when a path to citizenship opens. We are calling on the President to give our parents and everyone in our community the same relief he gave us,” said protestor Ireri Unzueta Carrasco, 26, a recipient of the Deferred Action for Childhood Arrivals (DACA). Unzueta was also arrested Wednesday morning. Twelve in total were arrested during Wednesday morning’s rally. The Senate Judiciary Committee passed Senate Bill 744, the Border Security, Economic Opportunity, and Immigration Modernization out of committee this week. The bill is now headed to the Senate floor for a vote in the next two weeks. 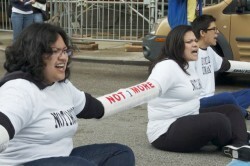 In the meantime, advocates will continue to demand that the President suspend deportations. Wednesday’s rally was organized by the Immigrant Youth Justice League, Undocumented Illinois, National Day Laborer Organizing Network, and the Illinois Coalition for Immigrant and Refugee Rights.